It's such a straightforward and worn-out premise, but there's something effortlessly intriguing about watching a group of professional treasure-seekers break into an ancient, mysterious place with unpredictable obstacles awaiting them. Chinese director Wuershan, whose creativity was responsible for the visually dazzling but otherwise lackluster Painted Skin: The Resurrection, obviously understands the appeal. Adorned with vivacious special effects and a supernatural spirit, the director's latest feature, Mojin: The Lost Legend, filters the mannerisms of a distinctly Western blockbuster adventure into a Chinese-language production, recalling the likes of The Mummy and Tomb Raider franchises in its mythical character-building and excavation for a long lost, magical relic. Unfortunately, it also conjures the more obnoxious side of that type of cinema -- trivial plotting, awkward flashbacks for back-story, and gawky humor -- resulting in a bloated and stilted descent into the caverns of fantastical excess. Loosely based on a fantasy novel series, Mojin: The Lost Legend centers on a group of professional treasure-seekers with gifted abilities and certain rules about their plundering, who are also longstanding friends spanning some twenty years. Shortly after their introduction, however, we learn of their retirement after a particularly traumatic job, one that left Hu Bayi (Chen Kun), their leader, in a burdened mental state. He and his partner Wang Kaixuan (Huang Bo) struggle to make ends meet as homeless street vendors in America, when they're approached with a monumental job offer -- delivered from a wealthy religious zealot -- that lures them back in the game. 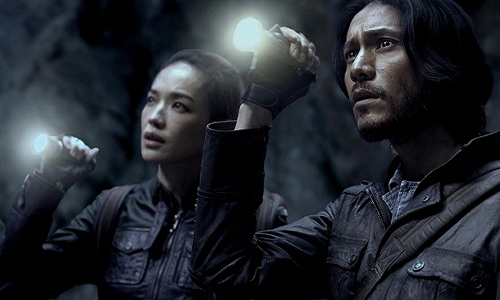 Reluctantly, and with the relationship between Hu Bayi and the third member of their group, Shirley Yang (Shu Qi), hanging over their heads, the three Mojin venture back to China in search of a Mongolian tomb ... and the mythical item, the Equinox Flower, contained within. Mojin: The Lost Legend come equipped with a robust cast that effortlessly brings personality to their tomb-raiding characters, from the melancholy attitude of Hu Bayi delivered by Chen Kun to the strong-willed and persuasive impishness of The Assassin's Shu Qi. Unfortunately, Wuershan squanders these talents -- and the potential of their characters -- on a peculiar, shallow grasp on tone and chronology. Starting with their initial excursion into the depths of a spiritual burial place, which follows a proclamation that these kinds of adventures are a "piece of cake" to the trio, Mojin: The Lost Legend never quite figures out how to raise the stakes and get beyond its quick shift from overconfidence in the explorers' abilities to ... well, their immediate retirement. Flashbacks transport the point-of-view to the communist revolutionist period in an attempt to deepen their characters with back-story, and while the movements throughout time are comprehensible, they lose all momentum leading up to the Mojin's return to duty. There's a moment where Mojin: The Lost Legend seems like it could start to work, based on pure curiosity once the exploration descends into its ancient destination and the characters start coping with the supernatural traps and puzzles. At this point, visual effects are minimal, with creepy makeup for human metamorphosis and craggy, cavernous set design setting the mood. It's here that Wuershan's plundering adventure recalls the more positive elements of its western influences -- little bits of The Last Crusade and the first two Mummy reboot films -- where dubious partnerships and rocky personal relationships emerge in the presence of mysterious and eerie sorcery. Simplicity works wonders for this concept, and for about ten or fifteen minutes, Mojin: The Lost Legend generates some expectation over seeing how things might fit together, combining religious zealotry, nasty humanoid pseudo-zombies, and the lingering memory of Hu Bayi's past flame into a batch of mysteries worth pursuing. This only lasts a brief timespan, however, before Mojin: The Lost Legend approaches the treasure trove of computer-generated wizardry waiting at the end of the tomb -- more Tomb of the Dragon Emperor than anything else -- mistaking bizarrely-designed locations and escalating enchantments for adequate diversions. Wuershan builds up an overwhelming obstacle for the film by relying entirely on anticipation and not on an evolving plotline, awaiting the discovery of the Equinox Flower's purpose and how Hu Bayi's former lover will eventually factor into their endeavors. All sorts of particle effects and illusions and deceptions hope to cast a spell over those watching as the Mojin progress deeper into the cavern, but the lack of a mounting story, aside from flashbacks, weakens the periods between grandiose set-pieces, rendering a blockbuster that both busts at the seams with activity and never really gets moving. Mojin: The Lost Legend proves that surrounding stock adventurers with curios as they enter and exit an ancient place isn't such a piece of cake.